Onkyo is famed for being first out of the traps with desirable new features, and the TX-NR807 is certainly no exception. This is the first receiver under £1,000 to feature Dolby ProLogic IIz and Audyssey DSX processing. Opinions on the merits of both formats and the need to move rear-back speakers to front-height or front-wide position are divided (largely between me and the HCC editor) but I am right and anyone who disagrees is wrong. Audyssey DSX and Dolby ProLogic IIz are a revelation in home cinema sound and a must-have for any modern set up. And now Onkyo has made this available in a stunningly specified THX Select2 receiver all for £800. It's not my perfect solution though. The TX-NR807 is still a seven channel amp, meaning you will have to dispense with rear-back channels to choose between either height channels or DSX width speakers. A little further up the Onkyo food chain are nine-channel amps that allow any two-out-of-three combination of height, width and rear-back. How long before 11-channel models emerge so you can use all three effects together? Like every Onkyo I have had the pleasure of reviewing over the last ten years, with the TX-NR807 you get a whole lot of amp for your hard-earned money – it's big, heavy and packed with features. It's clearly built to hit a price, though. The terminals are all a bit flimsy, the case feels like a biscuit tin and the set-up mic is so light that the weight of its own cable pulls it off any makeshift stand. Still that is what Blu-Tack is for – and that's going to add about a pound to the overall price. The TX-NR807's looks are straight out of Onkyo's in-house style guide, with a vivid blue highlight around the top of the volume knob that conspires to make the display look a rather wishy-washy green colour. 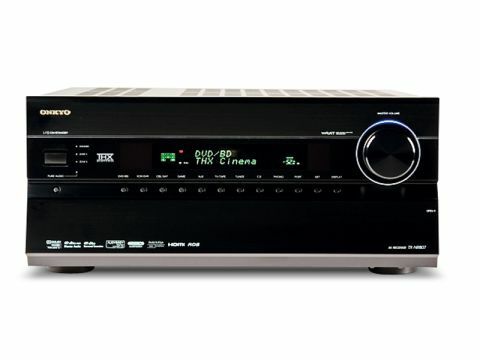 Some might find the Onkyo's lack of front-mounted HDMIs or any USB input a bit of letdown, but you do get full networking via Ethernet, vTuner access, six HDMI inputs, some multiroom functionality and all-input upscaling to 1080p. And it will, of course, decode those gorgeous Dolby TrueHD and DTS-HD Master Audio mixes. But back to DSX/DLP IIz. From past experience I plumped for a basic 5.1 set-up and connected up a pair of front height speakers to the relevant terminals. This has potentially the greatest benefit with a big projector screen and it plays into the sumptuous hands of both DSX and DLP IIz Height, whereas using front width speakers would only be of use with the Audyssey format. That and I don't really have room to squeeze in width speakers effectively. Configuration shenanigans aside, the back panel serves up a set of speaker terminals for every possible channel configuration, all eleven of them. The opening page on the GUI replicates the speaker terminal lay-out for ease of identification and allows you to bi-amp the fronts if you want to be a Luddite and ignore the benefits of front height channels. Setup is pleasingly simple and the network connection (over a tricky wireless Ethernet bridge just for the challenge of it) automatically detected and enabled the connection before I had even found the Network menu. The additional manual set-up for input assignments is straightforward and, at this price point, there are no deep menus (i.e. picture fine-tuning) to get lost in. Unfortunately, the flipside of the Onkyo's straightforward nature is an over-simplified remote control. There are precious few direct access buttons to the audio modes or EQ features, which means, for example, scrolling through up to a dozen audio modes (including such delights as mono) just to toggle between DPL IIz and DSX. For an incessant fiddler like myself, it's a pain, but fire it up for a movie and leave it in that mode until the end-credits roll and you won't have an issue. The TX-NR807's sound comes at you on steroids. It is incredibly crisp and blessed with a stunning transient attack at the top-end that would embarrass many amplifiers at twice the price. Playing the fast-paced opening sequence to Quantum of Solace (Blu-ray) in standard DTS-HD mode, the Onkyo all but picks you up and drags you along for the ride. Switch to DPL IIz or DSX, and the ride is sonically three-dimensional, adding plenty of vertical scale to the mix. The TX-NR807 thrusts the crashes, clatters, bangs and effects into the room with sheer gusto, and the gung-ho bass all but rattled a glass light-fitting off the ceiling. Strewth! A shrinking violet it is not. With the Audyssey EQ boosting the top-end in my slightly dead sounding room, the effect is fantastic; a fun and drop-dead impressive five-minute demo to wow your friends with. However, the LFE is just too big, too rounded and too forward in the mix to sustain a long movie without having to call time out for a break halfway through. This massive bass is perhaps the 807's weakest link. It's not particularly tight or punchy, despite there being plenty of it, and there's an uncomfortable drone to some of the lower rumbling effects. This can permeate the bottom-end of the vocal range, on occasion keeping male voices shut-in and chesty. Of course, backing down the sub setting allows a perfectly good LFE balance, but the bottom-end of the Onkyo's performance simply doesn't have the dynamism to match the incredibly fast and detailed top-end. Despite that, I still think the Onkyo provides a hugely spectacular vista of potent home cinema sound that fights well above its price point in terms of sheer entertainment value. Swapping between DPL IIz height and DSX modes, and engaging some of the THX Select 2 Plus postprocessing features, reveals a wealth of different sonic balances that will keep you twiddling for months. For instance, when added to a TrueHD soundtrack I preferred the slightly more detailed and open sound of DPL IIz over the more robust but heavier DSX balance. Either way, the upgrade in overall soundstage with both is excellent and, in my opinion, eclipses the sound of any like-for-like standard 7.1 set-up. And the tricks up the TX-NR807's capacitors don't end there. The vTuner access is very slick to use and Onkyo's music enhancer goes a long way to making low-bitrate music quite listenable. The Onkyo's Faroudja DCDi scaler with 'Cinema Enhancement' performs standard-def-to-1080p conversion with remarkable smoothness, and is one of the best I have seen in a sub-£1,000 amplifier. The acid test for scalers is Ice Age on DVD, as it is packed with graduated colour swathes. These areas often fill half the screen and can show really obvious banding. The Onkyo all but eliminates the banding in the lush blue skies of the film, leaving a softly-focused but much improved DVD picture. It's like a wholesale upgrade for your entire DVD collection. Onkyo's TX-NR807 is not the last word in subtlety where home cinema sound is concerned, but if you like your movies fulsome and fruity this receiver certainly fits the bill. Add to that the spectacular soundstage improvements wrought by DPL IIz, DSX and the THX modes, fabulous SD upscaling, great networking features and that £800 price tag, and it's safe to say that Onkyo has unleashed yet another first-class bargain on the AVR market.